Paturi is a very popular Bengali dish. Marinated Fish or vegetables cooked in wrapped inside the leaf. This dish can be cooked with hilsha or bhetki fish. And fish can be wrapped in banana leaf or bottle gourd leaf. 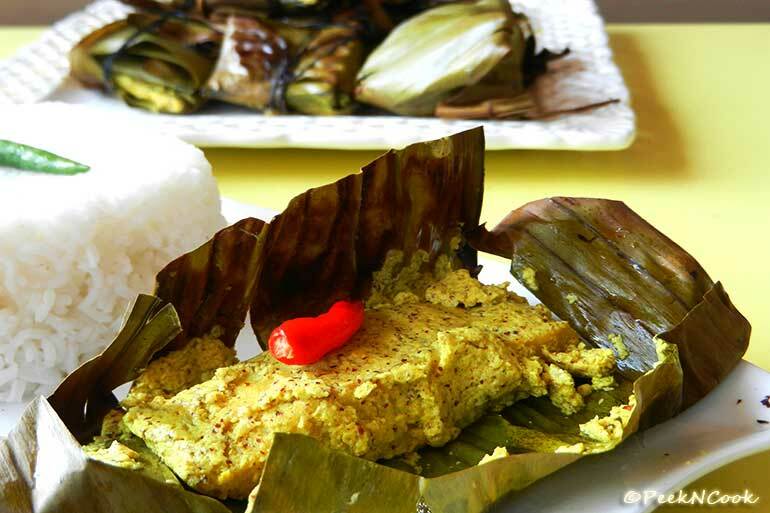 Here I've made this with banana leaf and sea bass instead of bhetki. Paturi is a very popular Bengali dish. Marinated Fish or vegetables cooked in wrapped inside the leaf. Cut the fish fillets in 4"/2" size and marinate them with salt, lemon juice & turmeric powder and keep them aside for 30 minutes. Now make a fine paste with all the seeds, coconut, some salt , garlic cloves, green chilies & little water and marinade the fish pieces with this paste and keep it for another 30 minutes. After 30 minutes add the mustard oil on the marinated fish and mix well. Now take the banana leaf and cut into 8/8" square shape and in a platter glossy side up, rub little mustard oil to it. Lightly roast the Banana Leaf on the heat to make it soft and foldable. Place a piece of Fish at the center of a 8/8" banana leaf and add some marinade on it. Place one green chili on top of it. Fold the leaf from each side and make it a square parcel and tie with thread that the parcels will not open while cooking. Now take a non-stick pan and grease some oil to it and place the banana leaf parcels in one layer and close the pan with an air tight lid and cook on medium heat for 10 minutes each side. When one batch is done on both sides remove them and place in an air tight container to keep the paturies hot. Again repeat the same process to cook the rest paturies. When all parcels will be done serve the closed parcels with steamed rice. Serve the hot Closed Percels with Steamed Rice. This recipe can be done with Hilsha & Prawn.